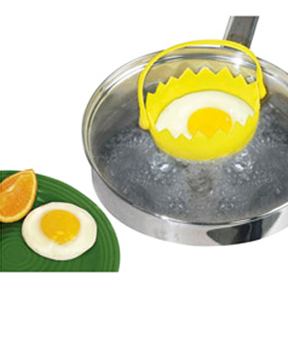 This fun looking gadget will take all of the difficulty and frustration out of poaching an egg. It is the fast, easy and foolproof way to cook an egg. Made entirely of silicone, it allows you to prepare perfectly cooked eggs in just minutes without hassle or difficulty. You will be able to prepare fancy breakfast items like eggs benedict or florentine with ease, and make it look and taste just like the professionals do. The Poach'R Silicone Egg Poacher doesn't take any special skills to use, and it produces perfectly shaped eggs in no time. Simply break an egg into the cup, and then place it into simmering water. Cook for about five minutes with the lid on the pan and you are done. Use the convenient, built-in handle to easily remove the silicone poacher from your pan, and then set it on the counter without it tipping thanks to the integrated feet. Since it is made of a heat resistant, and flexible material, it is incredibly easy to remove your egg once it is cooked. Just flex the yellow shell and your perfectly poached egg will pop right out. The container is both microwave and dishwasher safe as well, so you can cook your eggs in the microwave, or on the stove top, and clean-up is super easy. Simply place it in the dishwasher and your cleaning is complete. 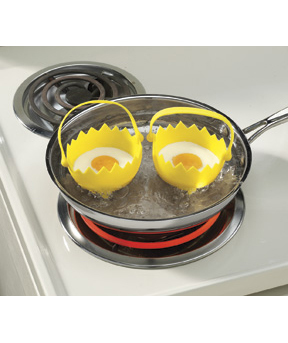 The Poach'R Silicone Egg Poacher is heat resistant up to 500 degrees, and freezer safe. This means you can even use it to shape frozen deserts and jello treats too. Now you can cook breakfast just like they do in your favorite restaurant, but without any of the skill, mess or hassle. This great little gadget makes one of the most daunting cooking tasks incredibly easy. Due to the design of the Egg Poach'R, anyone can create perfectly shaped eggs that are evenly cooked. The built in handle makes it easy to place in the pan, and remove when its done. The handle can even rotate down to allow for a cover to be placed on top of the pan without disturbing your eggs. Cook traditionally in a water bath, place it in the microwave, or even use a steamer. Any way you use the it, this silicone egg poacher will produce perfect looking, professional style results with very little effort. 100% silicone construction ensures a quick and easy release with very little mess, and almost nothing to clean up afterward. Plus it is super safe, and won't affect the flavor of your breakfast. You end up with perfectly cooked food, very little mess and you don't have to be a pro to use one. Get a single Egg Poacher or order more for an even lower price. Free shipping on any quantity. Order Yours Today! Dimensions 3.5" x 3.5" x 4"
Egg Poach'R by Evriholder - Prepare perfectly poached eggs in just minutes. 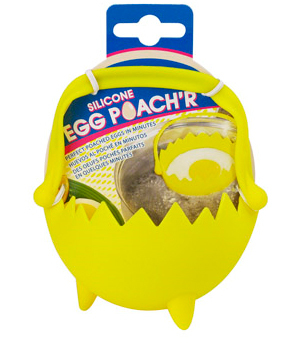 This silicone egg poacher makes it easy! A great little device. Egg slides right out. Easy to clean. Love it! They work just as they are advertised. I would order again if the need ever arose. I am very happy with this product and with the company. I have used the poachers several times, but it takes about 20 minutes to poach an egg, not 3 to 5 minutes as it says in the literature. I have resorted to flipping the eggs over after 10 minutes or so, and that seems to help. Not exactly what I expected. Bought them for the kids for Christmas cause they love poached eggs so now they can make their own (they are teenagers) whenever they want. Bought 4 of these cause they were cheap. Changed my mind; they aren't cheap, just inexpensive! I use them often and love them. At my altitude I have to poach for 5 minutes to get a soft yolk with done whites, but they are just right. Clean-up is as easy as a quick wash. I need complete directions for poaching eggs in an insert. Do you boil water before placing egg in cup? If s yes, how many minutes is water boiled for fully cooked egg while and soft cooked yolk? Yes. Add the cups to a pan of boiling water. It can help if you place the cups in empty, allow them to warm, and then add the egg. Cook for about five minutes for perfectly poached results. So how do you use this puppy? It's pretty simple. You could cook in the microwave if you wanted to, but most people opt for the stove top method. Just fill a pan with water, let it come up to temperature, and then place in the cups. Once they heat up a little bit, crack your eggs and let them cook. Using a lid can help to achieve the perfect level of done, and adding some non-stick spray can help to prevent any sticking, but it's not usually necessary. bring water to boil, covered, place egg in cup in water, recover and cook about 7 minutes--depending on your altitude and how you like your eggs..